Samsung Electronics unveiled a new smartwatch and fitness band along with the latest version of its Galaxy smartphone on Monday, demonstrating how the battleground for innovation is shifting from the hand to the wrist. The world's biggest smartphone maker set a trend less than six months ago for wearable devices that link to mobile handsets with its Galaxy Gear watch, which has seen rivals like Sony and Huawei follow in its wake. The switch in focus also underlines the challenges the South Korean firm is facing. Low-price Chinese rivals are churning out products that look increasingly similar at a time when smartphone sales have started to ease, taking a toll on Samsung's earnings. To fight back, Samsung is taking a less glitzy marketing approach to control costs. It has also performed a U-turn, abandoning its previous heavy focus on sweeping hardware improvements to highlight more subtle features in its devices and accessories in a bid to appeal to a wider audience. "With the Galaxy S5, Samsung is going back to basics," JK Shin, co-chief executive and president of Samsung's mobile business, told an audience of Samsung employees, partners and media at the annual Mobile World Congress technology trade show in Barcelona. Samsung will roll out the S5 globally on April 11, with pricing details yet to be disclosed. "Our consumers do not want eye-popping technology or the most complex technology," he said. Instead, they want beautiful design, a better camera, faster connectivity and technology that would help them keep fit, Shin said. Market expectations for the new S5, one of Samsung's marquee product launches this year, remain subdued given its comparative lack of innovation. "The Galaxy S5 has great features and will probably sell well due to massive marketing support," Forrester Research analyst Thomas Husson said. "But is the total product experience it offers differentiated enough to continue the sales success story? Is it enough to bet on fitness and fingerprint sensors to beat Apple - rooting the experience in people's daily lives? I don't think so." The Galaxy S5, which will be available in April, has a slightly bigger screen than its predecessor, at 5.1 inches compared with 5 inches, improved camera technology and better protection against water and dust, Samsung said. It also has a fingerprint scanner on the home button, which rival Apple introduced in the iPhone 5S last year. The function can be used to protect data and provide security credentials in a swipe. "It's very unlikely for the S5 sales to top its predecessor S4's performance during the key initial sales period," said Lee Seung-woo, an analyst at IBK Securities in Seoul. "I think sales would come in fewer than 20 million units in the first three months of the launch." At a relatively low-key launch event in Barcelona, Samsung also unveiled the Gear 2 smartwatch, which runs on the Tizen operating system rather than Google's Android software, and a stripped-down version called Gear 2 Neo, which doesn't have a camera. The devices can monitor the wearer's heart rate, a function used in increasingly popular health and fitness apps, or individual programs. The Samsung Gear Fit, also targeting the fitness sector, has a heart rate monitor, too, as does the Samsung Galaxy S5 itself, a first for a smartphone, Samsung said. 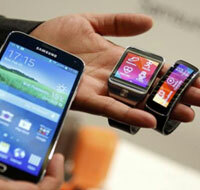 The Gear Fit has a curved touch-sensitive screen and its features include a pedometer, Samsung said. Shares in Samsung, Asia's most valuable technology company with a market value of $204 billion, rose 0.6 percent, versus a 0.7 percent gain in the wider market.